(P1) Elephants will perform for the last time at the Ringling Bros. and Barnum & Bailey Circus on Sunday, as the show closes its own chapter on a controversial practice that has entertained audiences since circuses began in America two centuries ago. Six Asian elephants will deliver their final performances in Providence, Rhode Island, and five will perform in Wilkes-Barre, Pennsylvania, during several shows on Sunday. The last Providence show will stream live on Facebook and at Ringling.com at 7:45 pm, reports the AP. Alana Feld, executive vice president of Feld Entertainment, which owns the circus, said the animals will live at its 200-acre Center for Elephant Conservation in Florida. (P2) Elephants have been used in the circus in America for more than 200 years. In the early 1800s, Hackaliah Bailey added the elephant “Old Bet” to his circus. P.T. Barnum added the African elephant he named “Jumbo” to “The Greatest Show on Earth” in 1882. 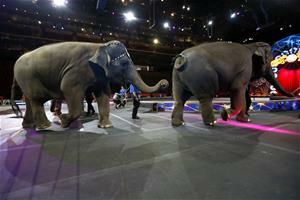 The Humane Society says more than a dozen circuses in the United States continue to use elephants. But none tour as widely or are as well-known as Ringling Bros. It’s also getting more difficult for circuses to tour with elephants. Dozens of cities have banned the use of bullhooks—used to train elephants—and some states are considering such legislation. Do you like going to the circus? Why or why not? Why do you think people like going to the circus? Should the use of bullhooks be banned? Why or why not? Tell me about something controversial in your country.